My last recipe post, 5 Simple Tips for Making Sashimi at Home, was logged on April 10th, 2014. That means it’s been almost a FULL YEAR since I’ve gabbed to you about a new food concoction. What’s up with that? I could blame the lack of sunlight – it’s hard to photograph recipes after work in the winter when it’s dark. I could blame life – I had a rough summer, and blogging wasn’t really my focus. I could blame work – I’ve had a lot more responsibly, which means longer office hours and less time for fun. But really, the truth is, I just haven’t felt inspired to blog. I’ve wanted to be out with friends, dancing, eating, drinking, and socializing. The thought of being at home alone, arranging plates and jotting down new recipe ideas on a weeknight just felt . . . sad. However, I’m happy to report that the ‘old Ali’ is back in all her boring glory. I’ve been painting after work, dancing inanely to Taylor Swift for hours at a time, organizing cupboards, surfing Pinterest for recipe ideas, and eating way too much dark chocolate while wrapped up in a afghan on the living-room couch. I’ve gone into full-on winter hibernation-homemaking-hideaway mode, and it feels great :) So here is the product of my first recipe back in the saddle, and ohh god, it’s a good one. Are you ready for a whole lotta fluffy, melting, chocolaty, breakfast goodness? Please meet my new best friend(s), Rolo Pancake Kebabs: This recipe came into existence on Sunday, as I was strolling through my local (Dutch) grocery store. My thought process went something like: I’m craving pancakes. I should buy mini pancakes. I bet I could do something cute with those. Put them on cupcakes? Haha pancake cupcakes. Or what about mini pancake sandwiches? Yum! With camembert and bacon and maple syrup drizzled on top? 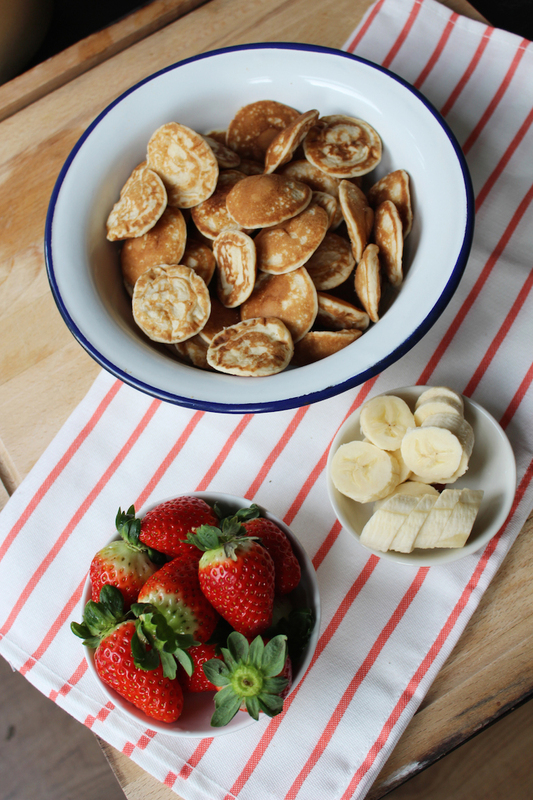 OR WHAT IF I MAKE mini pancake kebabs!! It felt right, and soon enough, I had a pack of 50 poffertjes in my shopping cart while excitedly wandering through the grocery store, looking for the perfect pancake-kebab accompaniments. Have you ever heard of poffertjes? To put it simply, poffertjes are mini Dutch pancakes. Typically, poffertjes are served in Holland in the colder months, topped with powdered sugar and butter (yum!) They’re akin to American pancakes, but they’re bite-sized, which makes them not only delicious, but totally adorable as well. 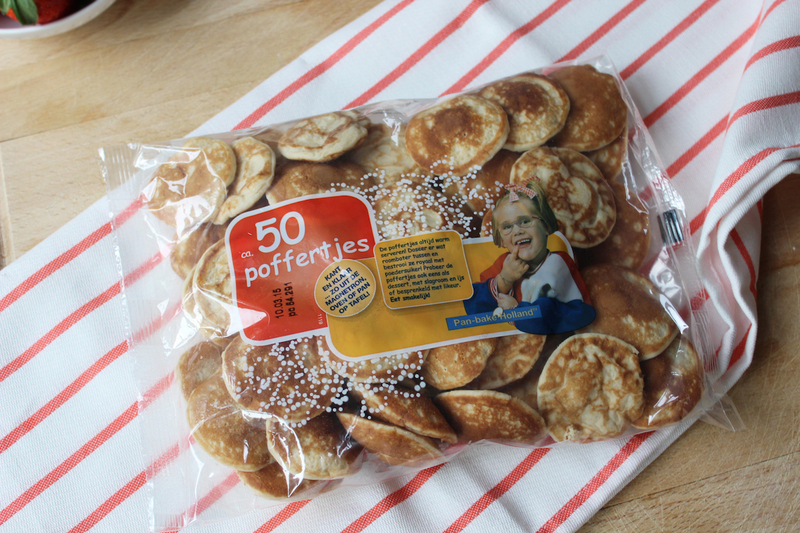 In the Netherlands, you can buy poffertjes made fresh from street vendors, or you can buy ready-made packs in the grocery store. 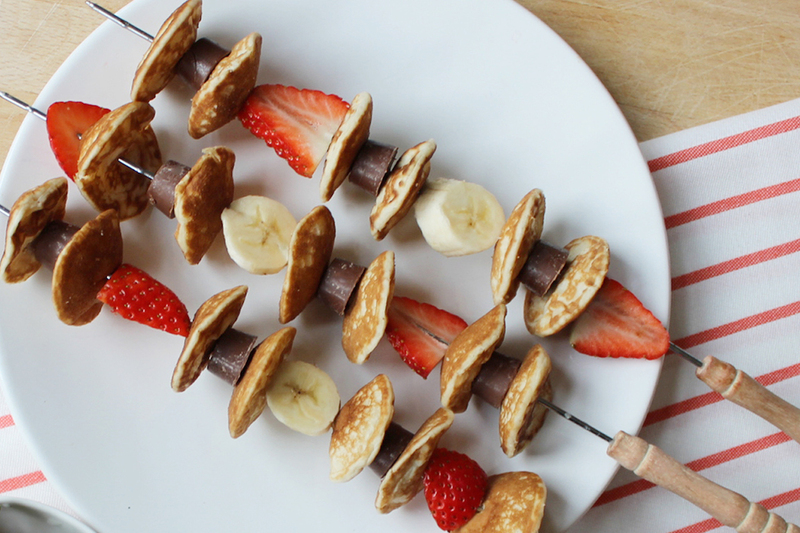 If you live in Holland, Rolo Pancake Kebabs are an awesome, no bake recipe. The first ingredient you will need are poffertjes, and these are pretty easy to come by. This really is the easiest recipe ever. 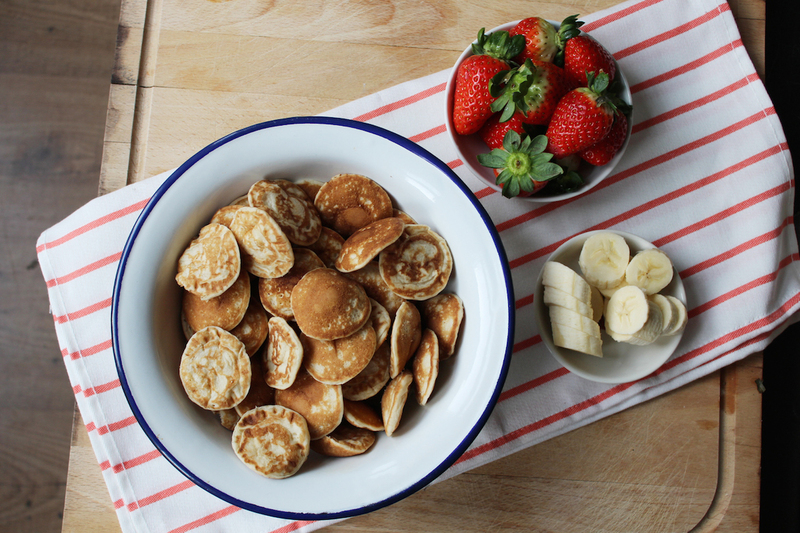 Heat your mini pancakes up in the microwave for about 45 seconds on high. They should be warm to the touch but not pipping hot (you don’t want to melt your chocolate just yet!) Chop your bananas into small wheels, and slice your strawberries in half length-wise. 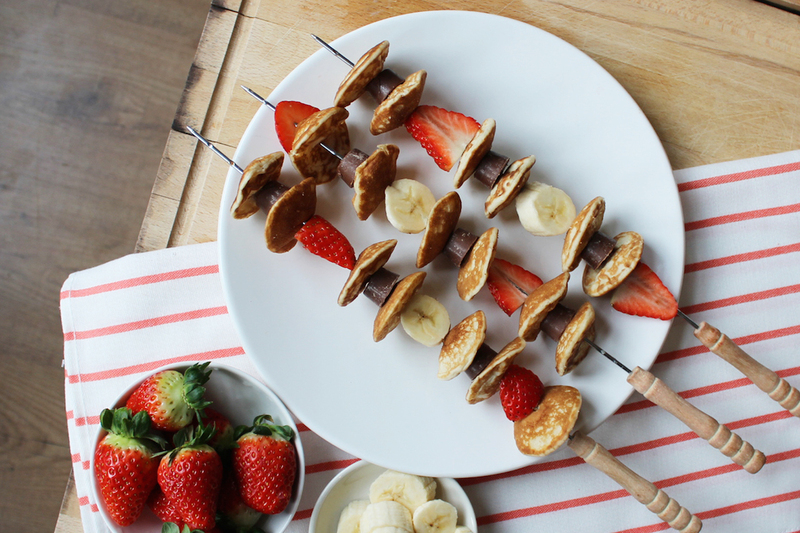 Take your skewers, and one by one, slide your fruit, pancakes, and Rolos onto the sticks. 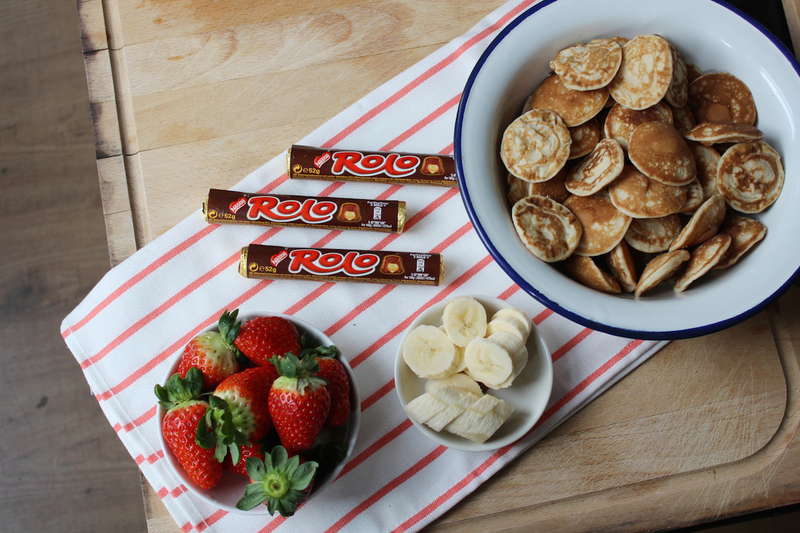 The only rule of stacking is that a Rolo must always be placed in between two mini pancakes (so when the chocolate melts, you have two big soft pillows to mop up the mess with). For 4x skewers, I used about 12 Rolos, 24 mini pancakes, 2 strawberries, and one small banana. Once your sticks have been skewed, you’re going to want to warm your creation up. Pop your plate of skewers in the microwave for about 15 seconds – just long enough to warm the chocolate, but not melt it into an oozing puddle everywhere. As I foolishly skewed my fruit, pancakes, and Rolos on metal skewers, I couldn’t pop them in the microwave. So I improvised and made a Nutella and yogurt dipping sauce, and ate them cold (which was delicious!) To make the dipping sauce, simply mix a teaspoon of Nutella with two big tablespoons of greek yogurt. 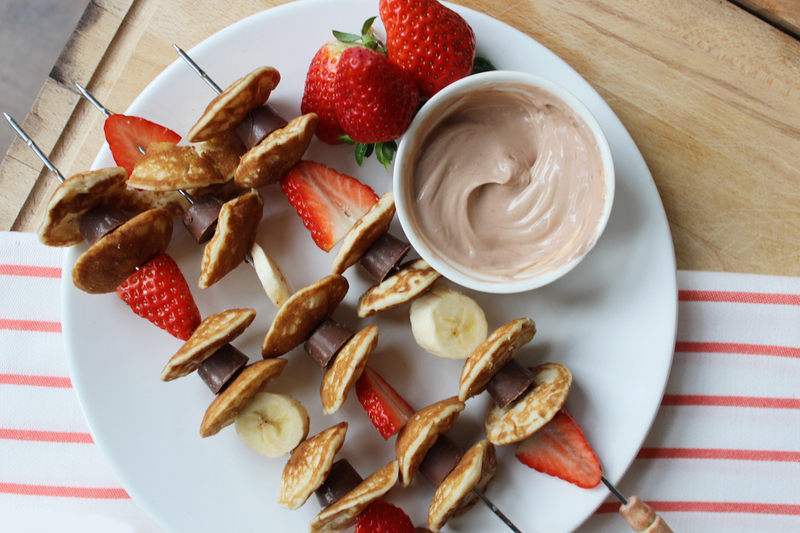 Stir until the chocolate is fully blended with the yogurt, and serve alongside your skewers. Sprinkle a dash of powdered sugar on top, and you’re good to dig in! 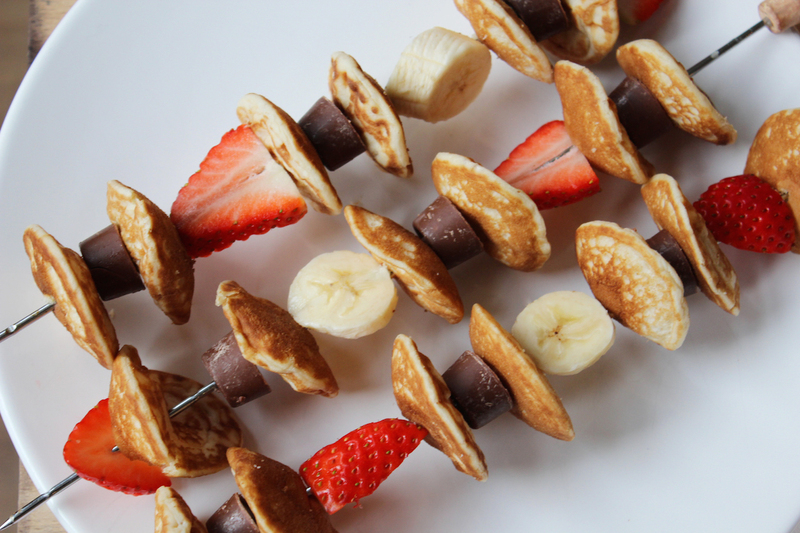 I brought a big plate of these Pancake Kebabs to a brunch party over the weekend, and they were a HUGE hit. They’re easy to pick up and snack on as you socialize, and they can be served hot or cold, for breakfast or for dessert! Bon appetite!! They are evil!! Wait until they start melting on your plate. You will be completely hypnotized and unable to escape! OMG Ali these look so good!!! These would be perfect for a brunch. Delish… who wouldn’t want one of these? Wow this is well worth the wait, for a new recipe!! Will have to whip up a batch of pancakes to try this out. I don’t think the old Ali is altogether boring – good to see you are back at enjoying life!! :) thank you! If you do make them, let me know how they come out! This is like a childhood fantasy fulfilled- yum yum yum!